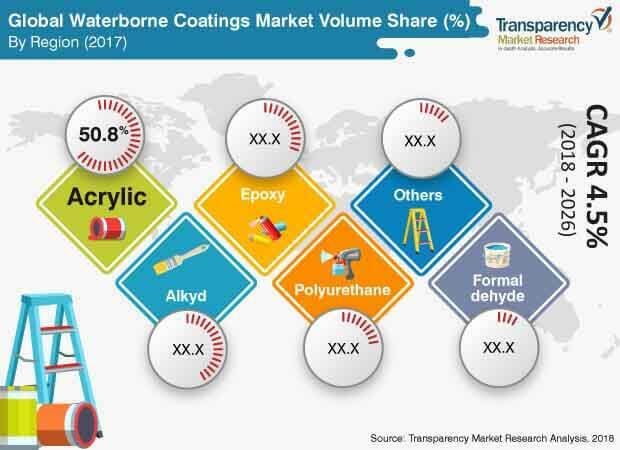 The global waterborne coatings market was valued at US$ 73.19 Bn in 2017 and is anticipated to expand at a CAGR of 5.0% from 2018 to 2026, according to a new report published by Transparency Market Research (TMR) titled ‘Waterborne Coatings Market: Global Industry Analysis, Size, Share, Growth, Trends, and Forecast, 2018–2026.’ The global waterborne coatings market is driven by the rise in demand for architectural coatings. Asia Pacific accounts for major share of the global waterborne coatings market, led by the increase in building and construction activities in the region. The architectural coatings industry has undergone significant transformation over the last decade. Currently, coatings have a much different raw material base, environmental profile, and properties. These changes have been brought about by various influencers such as synthesis chemists, paint formulators, end-users, and environmental regulators. The architectural coatings industry has experienced healthy innovation over the last decade. Conversion from oil-based paints to waterborne paints, decrease in emission of VOC content, removal of chemicals of concern, emergence of paint-and-primer-in-one products, need to provide improved film properties such as dirt pickup resistance and early rain resistance, and easy-to-apply new looks have been the key drivers of innovation. Demand for waterborne coatings in architectural application is driven by the growth in urbanization. This has resulted in increased demand for residential, commercial, and industrial infrastructure. Low interest rates on housing loans are also boosting the demand for new houses, thereby propelling the architectural coatings segment, especially in Asia Pacific. The segment is estimated to expand at a faster pace than the other application segments. It is primarily driven by the rise in demand for infrastructure requirements in residential, non-residential, and commercial sectors in Asia Pacific. Increase in population is augmenting the building & construction industry in the region. This is boosting the waterborne coatings market in Asia Pacific. Various governments across the globe have implemented stringent regulations to lower the VOC content of paints and coatings. This has increased the usage of eco-friendly alternatives. The waterborne coatings market has been expanding, as these coatings are eco-friendly and help lower the VOC components in traditional coatings. Waterborne coatings emit less VOCs content as compared to its substitute such as solvent-based coating. Decrease in emission of VOC such as organic solvents is one of the major challenges facing the paints industry. Coating and paint technologies adapt to environmental requirements. Development of waterborne coatings and solvent-free coatings signify new health and safety trends in coating technologies. The carcinogenic environmental impact of VOC has led to the substitution of solvent-borne coatings by waterborne coating systems. Among recently developed waterborne coatings, epoxy- and acrylic-based coatings hold dominance over other waterborne systems. Waterborne coatings offer up to 94% reduction in VOCs compared to alternative solvent and zinc liquid formulations, and up to 60% better corrosion resistance in salt spray and cyclic testing compared to e-coat and zinc formulations. Hence, demand for waterborne coatings is anticipated to rise substantially during the forecast period. Waterborne coatings could present a difficulty in the surface prep stage of a coating project. Water is a promising substitute for solvents in some situations; however, it is also a key component of corrosion. Humidity and temperature carry adverse effects on film formation and quality of waterborne coatings. At high humidity, a waterborne film is likely to remain wet and initially may be almost soupy, while at low humidity, the film may be too dry and have poor appearance. Therefore, automotive waterborne basecoats are sprayed in booths with temperature and humidity control. This is too expensive for most industrial paint users. These coatings are susceptible to environmental conditions, such as temperature and humidity, during the curing phase. Thus, these coatings are impractical in some climates. Asia Pacific leads the global waterborne coatings market, followed by Europe and North America. Latin America and Middle East & Africa are expected to be the key upcoming regions of the global waterborne coatings market during the forecast period. Significant increase in building and construction activities, especially in developing regions, is anticipated to be a major factor driving the waterborne coatings market in these regions. Waterborne coatings are widely employed in building and construction activities, as these coatings offer properties such as high gloss, better esthetics, and highly durable structures. Large number of small- and large-scale manufacturers operate in the global waterborne coatings market. These companies offer different types of waterborne coatings for various applications. Prominent players profiled in the global waterborne coatings market report are BASF SE, Akzo Nobel N.V., Asian Paints, Axalta Coating Systems Ltd., Altana AG, PPG Industries Inc., and Sherwin-Williams. Market players are adopting strategies such as pricing and product improvement to strengthen their market position.